I have another piece of student work for you to enjoy today, this time from Nicole Marais, who is nearing the completion of her BA, in which she is majoring in Media, Film, and TV studies. Nicole has focused on one of my favourite biblical characters – Delilah, from Judges 16. She first looks at her presentation in a painting from the 19th Century, before turning to consider the ‘Delilah-like’ character of Meredith Johnson in the 1994 movie Disclosure. Nicole’s discussion is fascinating and creative – I hope you enjoy reading it as much as I did. The first representation of Delilah we will be looking at is a painting by Paul Albert Rouffio entitled simply Samson and Delilah (1874). This is the moment just before Samson’s hair is shorn and the Philistines capture him and take him away to Gaza. 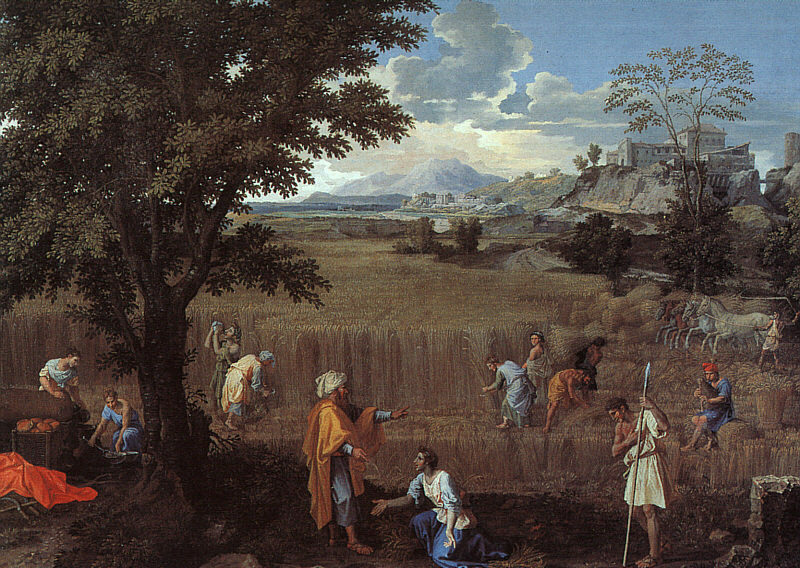 In Rouffio’s rendition, Delilah is being handed a pair of scissors by a female servant while the Philistine soldiers wait in an alcove for the moment to attack and seize him. This differs from the biblical text where the narrator tells us that Delilah called for ‘a man and she caused him…’ to cut Samson’s hair. (Judges 16:19) Here Delilah is the one to not only deceive Samson by telling the Philistines his secret, she deals the fatal blow by cutting his hair herself. Again in the text we are not told where this scenario unfolds. (Exum 82) Are we in Delilah’s house? Is this a brothel? Wherever they are here it looks to be a very opulent and decadent setting. The Egyptian art on the walls in the back ground is intriguing. Perhaps a marker of Delilah’s foreignness? None of the characters in the image engage with the viewer. At first glance Samson captures our eye, his vulnerability is twofold as he lays naked and asleep. I can’t help but feel compassion for this man who, in the glow of post coital bliss, has no idea that in an instant his world and legacy will change forever. The image serves a dual purpose too. While Delilah’s nakedness is intended to be a pleasure for the male gaze to behold, Samson’s vulnerability and the viewer’s knowledge of things to come serves as a warning against the power of female seduction. (Exum 78) If a great man like Samson can fall prey to the evil wiles of a woman’s sexual prowess, what hope do ‘normal’ men have? The biblical text says only that Delilah ‘made him sleep on her lap’. There is no evidence in the bible to point to their love making, yet Rouffio (and countless other artists before and since him) implies this in his interpretation of the text. In Samson and Delilah shown above, the state of undress of both Samson and Delilah as well as the crumpled sheets of the bed are more than a subtle hint to what has come before. If that were not enough, the pomegranates and figs next to Delilah’s bed are themselves symbols of Delilah’s heightened sexuality. I don’t think Rouffio was in any doubt of whether she loved him or not. Her facial expression in his painting is one of smug victory. A woman content in the knowledge that she has succeeded in her task. She appears to be very assured of herself, confident that he will not awake before she cuts his hair and knowing that when the deed is done she will be a wealthy woman. Or, if the decadent room in which this is set is indeed in her home, and not a brothel like I suspect, an even wealthier woman. 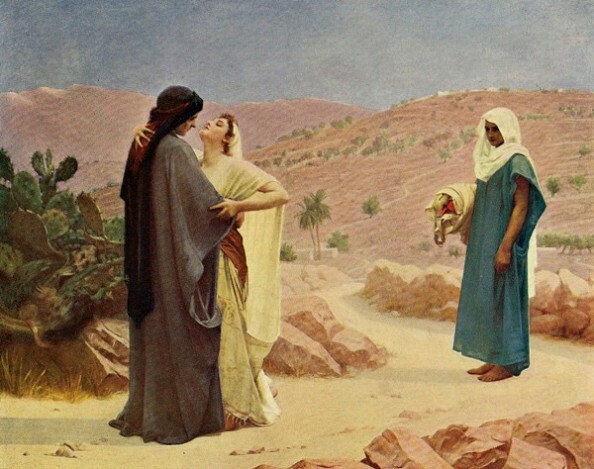 Dan Clanton argues in Daring, Disreputable, and Devout: Interpreting the Bible’s Women in the Arts and Music that there is a perpetual negative rendering of Delilah in literature, film and contemporary music. (Clanton 65) While Clanton focused on representations of Delilah in music, I will look at how Delilah, as the quintessential femme fatale, is given new life through Demi Moore’s portrayal of Meredith Johnson in Barry Levinson’s 1994 film Disclosure. Demi Moore is the ultimate Delilah incarnate. A femme Fatale that uses her sexual prowess to ensnare an unsuspecting man and thereby endeavouring to destroy him. However, unlike the biblical text where the all-powerful Samson is undone by Delilah, Tom Sanders manages to outwit Meredith and come out on top. Meredith is fired from her position of Vice President and Tom is lauded as the architect of a merger that will ensure his position at the company. It is unclear what Meredith’s reasons are for wanting to destroy Tom in such a grandiose manner. In Judges 16, Delilah agrees to help the Philistines when they offer her a handsome financial reward in return. However in Disclosure, Meredith’s justification for setting up and betraying her former lover remains ambiguous. Could it be that she is a woman scorned, who after 10 years still wants revenge for a love affair that ended badly? Or is she seduced by the idea of power? Does she want to be the top woman in a man’s world? Meredith admits as much to Tom in the beginning of the film when she tries to rekindle their romantic relationship. Like Delilah in the book of Judges, we are not sure what will become of Meredith after she is booted from Digicom. She tells Tom that she has already been approached by 10 head hunters in the hour since her public shaming at a press conference. Here Levinson insinuates that she will land on her feet. Like Delilah of the bible she will not be too severely punished for her actions, for which she too shows no remorse. Meredith Johnson in Levinson’s Disclosure and the Delilah of Rouffio’s Samson and Delilah are separated by a hundred and twenty years, yet have much in common. They are both used as pawns in facilitating the power play of a man’s world. Delilah is used by the Philistines to ensnare Samson and Meredith by the male members of the board at Digicom. They are both aware of their part in this power struggle and comply willingly. Delilah and Meredith reinforce the ideology that women are responsible for men’s undoing and are a threat to the fundamentals of a patriarchal society. (Anders 97) A world in which hetro-normative ideals of procreation and the family unit are to be preserved above all else. Women who challenge these ideals with their desire to forge a life for themselves that is not guided by the moral compass that a husband and a family will give them, are dangerous. What is interesting to me is that the Delilah of Rouffio’s painting seems to wield more power that Meredith does in Disclosure. This is of concern because Disclosure was set in the 1990’s, a time where gender roles were being questioned and women were being given opportunities that had since eluded them. In the end Levinson’s film, maintains the current gender status quo. Women are either sexually charged vamps who use manipulation to control and destroy men, or they are insipid and dowdy, only allowed to succeed if they put a lid on their sexuality so they can access their brains. A very disappointing rendering of Delilah indeed. Rouffio, Paul Albert Samson and Delilah, 1874. Disclosure. Dir. Barry Levinson. Perf. Demi Moore, Michael Douglas. Warner Brothers. 1995. Film. Anderson, Lesley Cecile Marie. ‘The Femme Fatale: A Manifestation of Patriarchal Fears’ UBC Retrospective Theses Digitization Project. University of British Columbia, 1995. Clanton, Dan. “Trollops and Temptresses.” In Daring, Disreputable, and Devout: Interpreting the Bible’s Women in the Arts and Music, 65-78. New York: T&T Clark International, 2009. Exum, Cheryl. Notorious Biblical Women in Manchester: Spencer Stanhope’s Eve and Federick Pickersgill’s Delilah. Bible Art Gallery. Edited by Martin O’Kane, 69-96. The Bible in the Modern World, 21. Sheffield: Sheffield Phoenix Press, 2011. As I mentioned in a previous blog post here, I taught a course this semester called Danger and Desire: The Bible and Visual Culture. It seemed to go really well, with some great student engagement and class discussions, not to mention a plethora of fabulous images to pore over each week. And, as the semester is drawing to an end, I thought it would be good to share some of the students’ work with you, so that you get a sense of how they have started to use visual exegesis in their reading of the biblical texts. Over the next few weeks, then, I’ll be posting various essays by the students to showcase some of the creative ways that they have been engaging with the Bible and visual culture. To start us off, here is an essay by one of our visiting students this semester – Anna Alexander is on exchange from New College School of Divinity at the University of Edinburgh and throughout the semester, made a fabulous contribution to the class. Here, she talks about that classical biblical femme fatale Salome and her depiction by late 19th-early 20th Century British artist Aubrey Beardsley. Hope you enjoy. How can Aubrey Beardsley’s depictions of Salome be seen as a radical departure from the tradition of her visual representation? 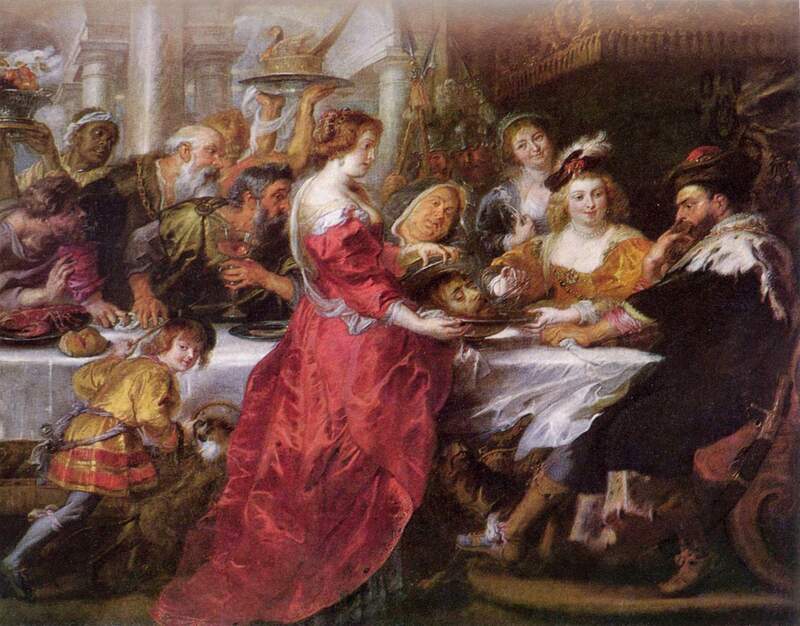 The figure of Salome is iconic and recognisable worldwide: an image of a beautiful woman, kissing a decapitated head. However, what is so interesting about the figure of Salome is that she is an invisible woman. The origins of Salome lie in the gospels of Mark and Matthew, where she is unnamed and a peripheral character. So why and how has Salome become such a striking visual image and, moreover, a visual image which is of very little relevance to the original story? Aubrey Beardsley’s illustrations of Oscar Wilde’s play Salome can be, I argue, seen as a radical departure from the tradition of visual representations of Salome, as well as directly critiquing and exposing the narcissism integral to the mythic representation of this marginal biblical character. The original source of Beardsley’s illustrations can be seen as rooted within the parallel biblical passages of Mark 6:21-29 and Matthew 14:6-11. 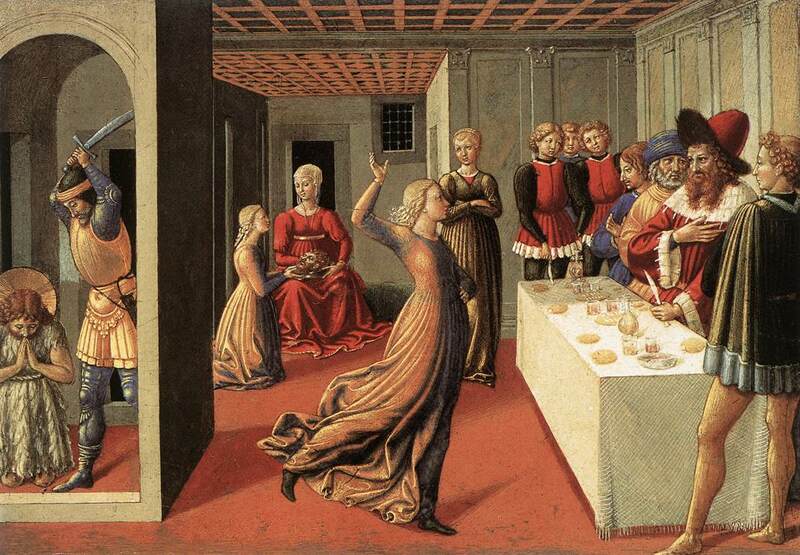 Within both stories ‘the daughter of Herodias’ is told to dance for Herod, which pleases him so much he publically promises to give her anything ‘unto the half of my kingdom’ (Mark 6:23). In both passages the unnamed daughter then asks he mother what to request, who instructs her to ask for the head of John the Baptist on a platter. Herod is then bound by his word, presently acquiescing to her request. What is of tantamount importance when reading this text in light of Beardsley’s visual depiction of the story is that Salome is unnamed. We only know her to be Salome thanks to the works of Jewish historian Flavius Josephus. Additionally, I would like to point out the contentious nature of this story as Amanda Riter points out in ‘Villain or Victim: Transforming Salome through Adaptation’, by explaining the conflicting reports of this source. Scholar Josephus in The Antiquities of the Jews attributes the death of John the Baptist not to Salome or Herodias, but to Herod who feared he might use his popularity to overthrow him (Riter, 19). This essay focuses on the interpretation of the biblical text, but I believe it important to point out confusion of events resulting in John’s death, especially considering there is an account which completely omits Salome hence ridding her of any culpability. It is interesting therefore that such a mysterious and seeming invisible woman, whose contribution to the death of John is questionable, has become an extraordinarily visible and visual representation of a femme fatale in contemporary culture. The history of Salome’s visual representation spans centuries, and the manner of her depiction wildly varies from being, as a dancer the ‘ideal subject for depicting the beauty of the human form’ (Bucknell, 504) in the 16th century, to a heavily sexualised predatory female figure. 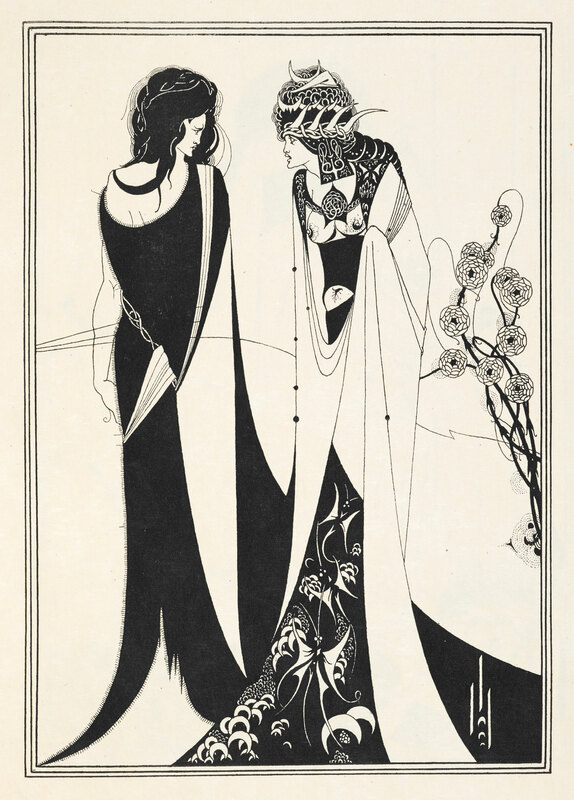 Aubrey Beardsley’s artworks can be seen as the most radical interpretation of this figure. 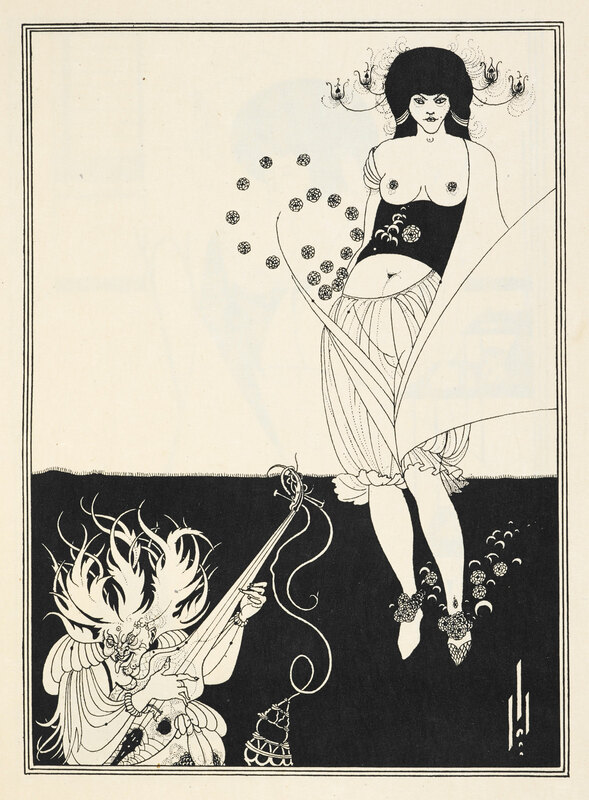 Whilst Salome had already moved from being a background character in the biblical story to occupying a central role in the interpretations of the story, Beardsley and Wilde’s collaborative venture transformed Salome from an ‘exquisite caricature’ (Gilbert, 142) to a figure with an ‘empathetic dimension’ (143). I shall be examining Beardsley’s works ‘John and Salome’, ‘The stomach dance’ and the ‘Eyes of Herod’. These images are visual adaptations of the story, but where adaptations are traditionally ‘meant to trigger the Viewers memory of a familiar story through the use of a single static image’ (Riter, 20), the recognisability of these famous artworks, would only call Salome to mind of a contemporary audience, for they can be seen to be vastly ‘irrelevant’ to the actual story. So this begs the question: why has this ‘irrelevant’ image of Salome prevailed in contemporary consciousness? This is perhaps because it is offers an incredibly self-aware depiction of the archetypal femme fatale nature of the figure of Salome, as well as boldly exposing the extent to which her visibility and mythical character are born out of a history of male anxiety of the power of women, through his heavily stylised and fantastical work. 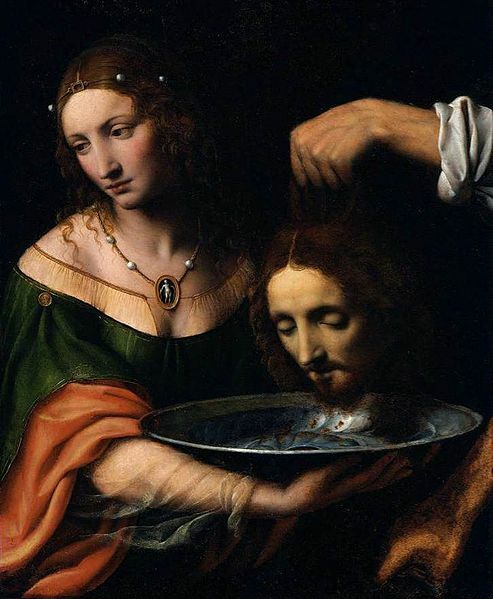 Salome’s perceived power is not only depicted as being rooted in her sexuality, but as Brad Bucknell points out it is this coupled with her command of ‘the Word’ which is traditionally reserved for men. Bucknell highlights how although Salome is unnamed – unlike her mother Herodias – she is given a voice and is able to address Herod, also unlike Herodias. The emphasis on oaths in the story is crucial as it is the power of oaths (The Word) which initially keeps Herod from killing John and instead imprisoning him, and it is the power of Herod’s public oath, that means he must fulfil Salome’s gruesome request. Thus, ‘the power of the word is inverted and turned back upon its possessors, the prophecy and the power of the tetrarch’ (505): essentially Salome undermines the complete authority of the patriarch. 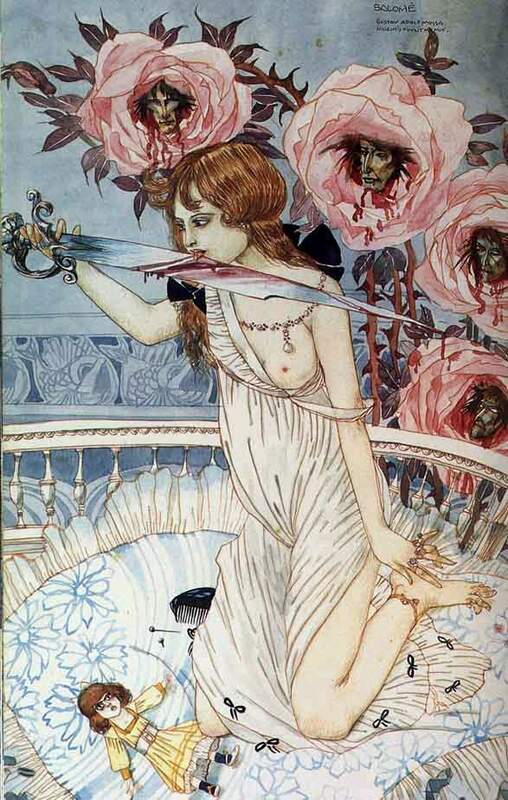 Therefore Salome is an incredibly powerful and threatening figure, as not only does she possess a powerful feminine sexuality, but also a masculine command of the word which she uses to kill a man. This idea of a power of androgyny is explored in Beardsley’s work in ‘Salome and John’ and ‘The Eyes of Herod’. 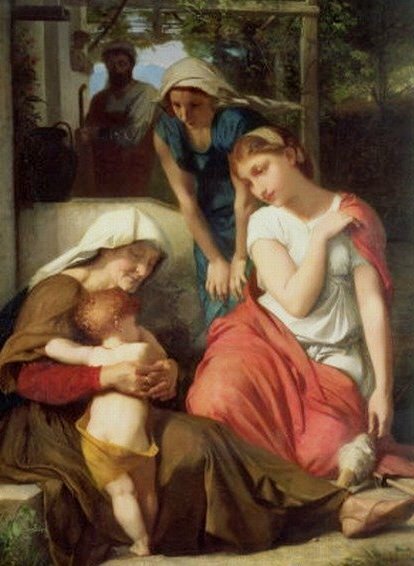 In ‘Salome and John’, both figures share the same indistinguishable gender in their facial features, and could both be male or female, if it were not for her exposed breasts. Additionally in ‘The Eyes of Herod’ Salome appears to be more masculine, if it were not for her naked breasts. In both these images Salome therefore can be seen as simultaneously embodying the power inherent in males and the sexual power of the female. Moreover in ‘The Eyes of Herod’ Salome is above Herod thus illustrating her superior power her androgyny instils her with, making her the ultimate threat to the patriarch. Ultimately however, her power is traditionally seen to be rooted in her sexuality, which is emphasised in the manner of the dance she performs: that of the seven veils. 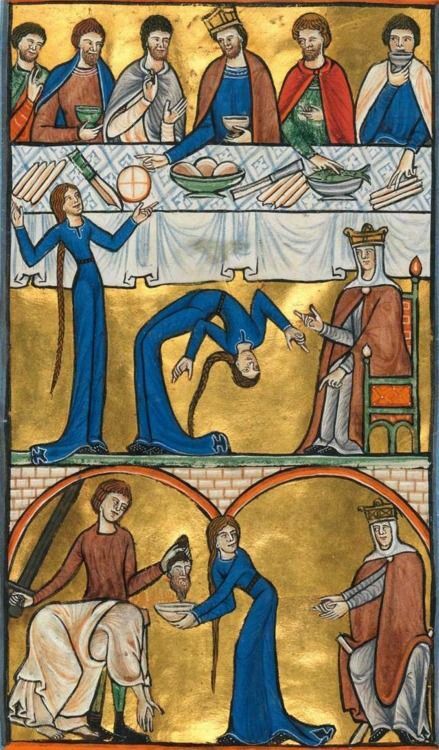 Again, this interpretation of the dance is completely imagined, as the source gives no indication of the nature of her dance only that ‘it pleased Herod’ (Mark 6:23). The reinterpretation to that of the seven veils indicates the cultural influences of the fin de siècle in which Beardsley was working, namely that of orientalism. By transforming the dance into an exotic sexual striptease, Beardsley heightens Salome’s mythical sexual potency, whilst also exacerbating a sexual perversity, as she is performing to her step-father/uncle. In ‘The Stomach Dance’ Salome is depicted levitating off the ground, with flowers and moons swirling around her. This heightens the image of Salome as some sort of enchantress, whilst her eyes, boldly staring forwards, imply complicity and assertion of her actions. This is a woman commanding the power of her sexuality. In the corner of the picture is a grotesque goblin playing an instrument. This is of course, completely unrelated to the story of Salome and gives the picture a fantastical quality. Yelena Primovac in ‘Illustrating Wilde: An examination of Aubrey Beardsley’s interpretation of Salome’ sees ‘Herod’s lechery embodied in the grotesque “drooling dwarf”’ (victorianweb.org), thus implying the presence of Herod’s gaze within the picture. The presence of the male gaze is fundamental to the myth of Salome, and is explored within Beardsley’s works. From the Bible story itself, Salome’s inception is only possible through the gaze of Herod – she is an invisible woman made visible when Herod sees her dancing. This invisible figure has been made visible over centuries of artist’s depictions: she does not exist without her visuality and visibility. Bucknell argues that Beardsley sought to highlight the solipsism of the gaze and its influence on the creation of Salome. In this sense Bucknell argues that Beardsley and Wilde both sought to expose how the figure of Salome had been created and imagined through artists, and therefore are inseparable to their creators. The idea that the gaze is solipsistic showcases an impossibility to look without projecting one’s own image onto the subject. This is most boldly presented in ‘The Eyes of Herod’ where Herod’s face resembles that of Oscar Wilde himself. It is through elements such as these, combined with anachronistic and fantastical features that Beardsley can be seen to be ‘implicitly critiquing such myth making by exposing the solipsism of gaze’ (Bucknell, 516), and revealing the narcissism present in all representations of Salome. Therefore, because the images are so removed from any genuine source knowledge or objective reality at all, Beardsley is able to explore how Salome is a fundamentally constructed character, only existing and made visible by the male gaze. Therefore any notions of Salome being the ultimate femme fatale, are ultimately critiqued as being a projection of the creator’s anxiety towards such a potentially powerful female, and ironically it is by endowing Salome with the embodiment of this male anxiety, which has ensured her continuing existence and re-imagination within contemporary arts, arguably making her a contemporary icon of female power. Gilbert, Elliot L. “Tumult of Images”: Wilde, Beardsley, and “Salome”’. Victorian Studies. Vol. 26, No. 2. pp. 133-159. 1983. Print. Primorac, Yelena. 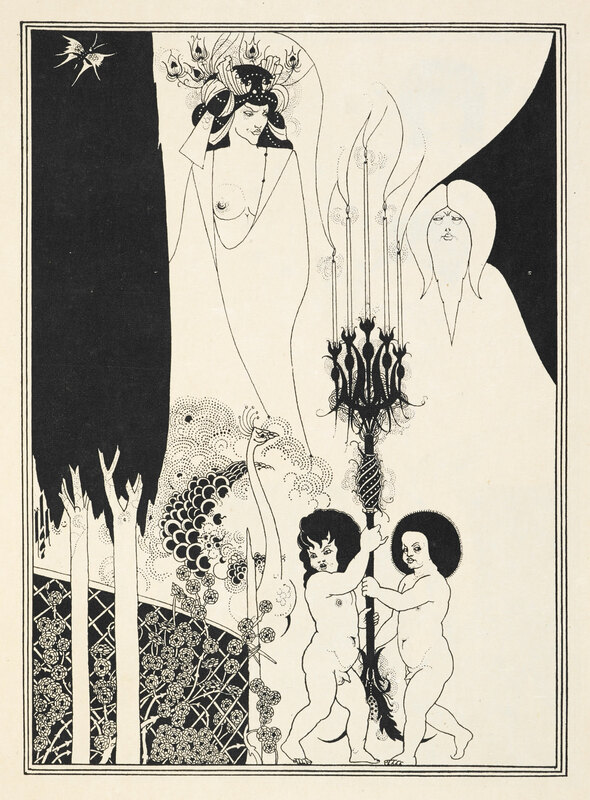 ‘Illustrating Wilde: An examination of Aubrey Beardsley’s interpretation of Salome’. The Victorian Web. 2009. Victorianweb.org. Electronic Resource. Riter, Amanda. ‘Villain or Victim: Transforming Salome through Adaptation’. Interdisciplinary Humanities. Vol. 31. Pp. 18-31. 2014. Print.